All across the country families are gathering this Memorial Day holiday in parks, and backyards, on front porches and poolside. We have loved seeing the beautiful, patriotic photos filling our feed all weekend. Best of all, having Romabio Classico Limewash as a backdrop to your memories, warms our heart. 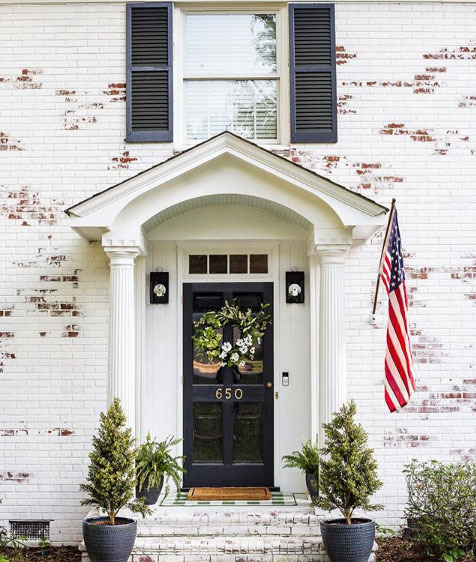 Today, one of our favorite home bloggers, Lauren from Bless’er House (who is the wife of a Marine Corps veteran), posted a photo of her family’s flag hanging by her beautiful front door with the words, “Land of the free because of the brave. Hope you have a beautiful day surrounded by loved ones in remembrance and gratitude, friends!” We couldn’t have said it better. Romabio is closed today in observance of this very important American holiday, but we will re-open our main office in Atlanta on Tuesday. Celebrate safely, and happy painting! Previous Post: « Happy Earth Day!